Today we would like to write about what we call Swags & Jabots here at Fashion Window Treatments. This very popular window treatment style can also be referred to as a Festoon & Cascade. The word festoon originated from the Latin word festo and was used to describe a wreath or garland hanging from two points. When depicting fabric or linen the motif became known as a swag, as to hang in a drooping curve. A jabot, which can also be called cascade or tail, is a vertical, normally pleated piece of fabric used with festoons or swags. The original purpose of a jabot was to hide the seams between individual swags, though their purpose today is simply decorative (unlike most curtains, jabots do not serve to block the passage of light). Visually, they represent a continuation of the swag over the ends of a pole or board, and are generally made of the same decorator fabric on the facing side as the swag itself. Jabots are often lined with a different style or color of fabric which is then revealed along its bottom edge with each pleat. One can also use the same fabric to line the jabot as the main swag and jabot fabric, which we refer to as “self” lining. A swag pelmet is a decorative accent piece that we fabricate in the same fabrics as your jabots. Pelmets come in many different styles and sizes, however, we fabricate ours in a pleated fashion to coordinate with our pleated jabots. Most people who use pelmets with swag and jabots are after a more formal appearance for their room. Pelmets are used typically wherever two swags meet and don’t overlap and can be used on top of or underneath the swags. When trying to determine how many of our semi-custom swags you will need for your window, first determine your rod width. We give several suggestions to swag combination’s on the website and we are more than happy to assist you in determining how many and what width swags you will need for your windows if you don’t see your size rod on the site. Swag and Jabots are at the top of many decorators lists. Swags and jabots offer your windows timeless elegance and can be sewn as a rod pocket style treatment, a board mounted window treatment and they can also be fabricated to be hung on a decorative pole. The number of swags needed is determined by the width of the window. A standard window would have one swag, whereas a window that is 100” wide would typically have three swags. Not all swags are the same. A bias cut swag will have a smoother drape to it than a standard swag. This is because a bias cut, means the fabric is cut diagonally across the fabric as opposed to being cut on the straight of the fabric, so in turn the fabric has a much smoother drape to it and is made with an extra fold for additional fullness. Many times you will see pelmets hanging between swags. Pelmets are used simply to give the window treatment a more distinctive appeal. Some choose to use pelmets under their swags (where 2 swags come together) and yet others will put them over top of the swags. Jabots are typically used with swags on a window and come in many lengths. There is no right or wrong when it comes to the length you would like to use on your window. Jabots have been made to hang as little as 1/3 of the windows length up to several inches below a windows length or to the floor. It really depends on the look you are after. Normally if someone has a view they adore and want to use the treatment to accent the window, shorter jabots are often used. Shorter jabots offer a more casual appearance, whereas longer jabots are typically used for a more formal look. If you love the look of jabots, but don’t like the appeal of typical swags, there are alternative flat valances, namely the Sherwood or Nottingham that can be used with jabots to give your windows a great look alternative look to the standard swag. Chair seat cushions are a great compliment to a finely adorned holiday table. Not only do chair cushions make your table look fantastic, they also are extremely comfortable. Our cushions come in over 350 different fabrics which can be paired with our custom table runners, napkins, placements, and dining room swag curtains for an elegant look. Our chair seat cushions come in two sizes to fit standard and extra deep chairs. They also come with 3″ attached chair ties and four circle tacks which simulate buttons. Overlay swag curtains give your room a unique look. If you are looking for something different in swag curtains, the overlay will spruce up any room. The overlay gives your windows an elegant look with fabric flowing up across then down the side of the window. Chose from many different patterned fabrics to find the one perfect for you. Each overlay set includes a swag and jabot with drapery pins attached for mounting on drapery rings. Make your room have the look you want with custom curtains from Fashion Window Treatments. Swag curtains are an elegant addition to any room. 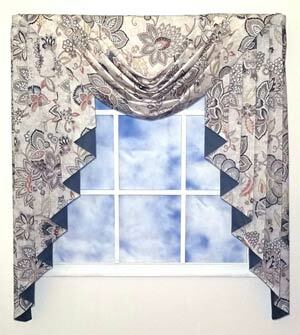 Our swag curtains can be fabricated in a variety of elegant fabric colors and patterns. Chose from a pole swag or a traditional swag curtain to fit your style. Even if you have a double or triple sizes windows, multiple swags can be used to out fit your window like a professional. Have a swag curtain tailored to the length and width desired for your windows. As always, we can also customize your throw pillows to match. Give your room a quick make over with new swag curtains.